The Parade was the inspiration of Chuy's co-founder Mike Young. In 1987, Chuy's & KLBJ-FM started an annual toy drive held at the two Chuy's locations in Austin to benefit the Operation Blue Santa Program. Two years later, Mike decided it was time to raise awareness for the Toy Drive and collect more toys by putting on a Parade. 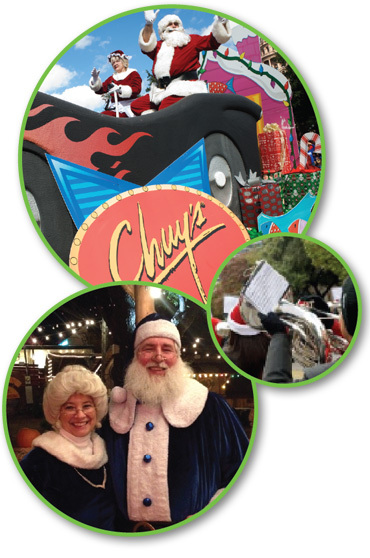 In 1989, a couple of weeks before Christmas, Chuy's volunteers canvassed the downtown area, passing out fliers, asking everyone they saw to bring a toy to work with them on a specified day and the parade would come along, pick up their toy and deliver it to Blue Santa Headquarters. The following Thursday, Chuy's friends and employees on bicycles along with the Grand Marshal, Joe Sears of Greater Tuna; Marcia Ball on the back of a flatbed truck; a Fire Truck; and a Giant three-man Santa Claus paraded up one side of Congress and down the other, stopping to pick up toys along the way, including a giant Teddy Bear from Governor Bill Clements. That year, the parade and the next day's Toy Drive at Chuy's with KLBJ-FM nearly tripled the amount of toys raised from previous years for Blue Santa. 2019 marks the 31st Annual Children Giving to Children Parade, benefiting Austin Police Operation Blue Santa. To date, we have collected over a quarter of a million toys for the children of Central Texas. And it is made possible by the thousands of spectators, young and old alike, who come oute, who came out each year and share in the great joy of giving. it's an event complete with giant inflatable balloons, festive holiday floats, spectacular marching bands and Santa, that brings a smile to the child who gives and to the child who otherwise might not see anything under the tree Christmas Morning.